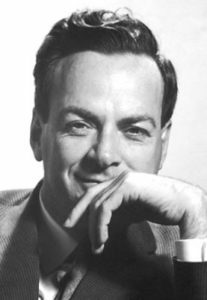 Richard Phillips Feynman (1918-1988) was born in Queens to Lithuanian Jewish immigrant parents. Before his birth, his father had decided that his son should be a scientist, and raised Feynman from an early age to question everything. Feynman did not speak his first word until he was three years old. In childhood, he loved to take things apart and even set up a lab in his home, hiring his little sister for 4 cents a week to be his assistant. (He would later inspire and encourage her to become a renowned astrophysicist in her own right.) At 15, he taught himself advanced algebra, calculus, and trigonometry. He applied to Columbia University but was rejected because the quota for Jewish students had been filled. Feynman went to MIT instead, first majoring in math, then electrical engineering, and finally physics. He published his first two papers as an undergrad, and his senior thesis (putting forth what would become the Hellmann-Feynman theorem) brought him a great deal of recognition in the scientific community. Feynman then applied to grad school at Princeton, and got an unprecedented perfect score on the physics exam. Again, he was initially brushed aside for being Jewish before the dean was convinced not to miss out on the young genius. (Feynman was admitted only on the condition that he wouldn’t get married!) At 23, he defended his Ph.D, and was already being compared to Einstein (he would win the Albert Einstein Award in 1954). Meanwhile, Feynman was working on the Manhattan Project, leading a team developing the isotron (to isolate uranium-235), then developing what’s now called the Bethe-Feynman formula for fission bomb yield. At Los Alamos, he was one of the “human computers”, and helped to develop better machinery for some of the world’s first digital computers. Towards the end, he spent time lecturing on the dangers of nuclear power, and put together a safety manual for uranium enrichment. After the war, Feynman joined the faculty of Cornell University, and there developed his famous (and revolutionary) “Feynman diagrams” to solve and explain quantum problems more easily. After a sabbatical in Brazil, Feynman moved to Caltech, working on superconductivity, superfluidity, nuclear decay, and quantum gravity, among many other subjects. He is credited with being the first scientist to conceive of both nanotechnology and quantum computers. In the 1960s, he began writing books on physics, many of which went on to become bestsellers and university textbooks. In 1965, he won a Nobel Prize for his theory on quantum electrodynamics, and in 1979 won the National Medal of Science. Feynman became even more famous in 1986 when he lead the team that investigated the crash of the space shuttle Challenger. Feynman was voted by scientists as one of the 10 Greatest Physicists of All Time, and Bill Gates recently wrote an article (titled “The Best Teacher I Never Had”) about how it was Feynman that served as his greatest inspiration. Feynman was famous for his sense of humour and his rebellious nature. 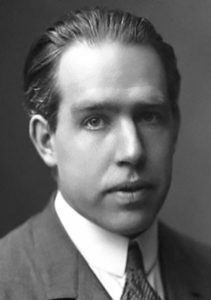 He rejected his religion (though at a later age encountered the Talmud and said it was “a wonderful book”), resisted his superiors (he was sought out by Niels Bohr because all the other physicists were too fearful to argue with the great Bohr), and even derided his Nobel Prize (saying the real prize was the scientific discovery). Feynman also loved biology and poetry, and was an avid painter and musician. Last Friday would have been his one hundredth birthday. This entry was posted in Science & Technology and tagged Caltech, Challenger Disaster, Cornell, Lithuanian Jews, Los Alamos, Manhattan Project, MIT, Nanotechnology, Nobel Prize, Nuclear Bomb, Nuclear Physics, Physics, Quantum Computers, Quantum Electrodynamics, Quantum Physics, Queens, Talmud on May 17, 2018 by Jew of the Week.